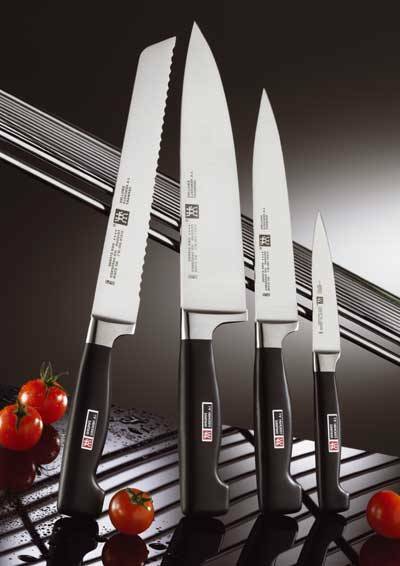 Knowing when to use the right knife for food preparation can be as important as the food it's self! You wouldn't use a paring knife to chop a beef primal, nor would you use a cleaver to make a veggie rose. Right now most households have two to three times the knives they need. And of those, three quarters are stored away in a butcher block or worse, in a forgotten drawer never to see the light.So what type of knife do you need? Well most stores are always willing to sell you a special knife for every possible food that you may encounter. Think back to the Ginsu knifes... Remember them? Remember the sales pitch? "It can cut thru a can and still slice thru a tomato in a breeze!" There is a reason that they sold you not only one 14 piece set, "but if you called now", they would send you another complete set FREE! The reason? They are cheap to make, hard to maintain, if at all, and by the time you realize it, the time has expired to return them (if you could!). Result? A drawer of useless knives. I, as many other chefs, use one knife as our primary knife. For me it is a eight inch chef knife. But for others it is what ever type they will use.. alot! And that is really the key. The knife that you use the most should be the center ofyour collection. Then build around that knife. Again for me, I have a chef's eight inch knife, a paring knife, a slicing knife, which is like a chefs knife but not so wide and last, a serrated bread knife. I can slice, dice and de-bone with my chef knife, fillet and slice with my slicing knife, slice small items and make veggie art with my paring knife, and slice a roast or a fresh loaf of bread with my bread knife. Many Asian chefs are trained to use only a cleaver.. for everything! Again it's about what you are willing to use and make as your primary cutting instrument. If it's not comfortable to use, then the likelyhood that you will continue to use it is almost nill. So what to look for in a good quality knife? Well let's look at the anatomy of a knife. While they are many aspects associated with a knife, focus on just the balde, the handle, and the edge. The rest of the components will vary from knife to knife. The blade should be forged from a single piece of steel that runs the entire length of the handle. Currently there is alot of talk of knives with a ceramic blade. Try to avoid the temptation to get one. The high price tag doesn't account for it's lack of durability. And unless you are cutting veggies or soft meats all day, ceramic is not very forgiving when encountering hard and or metal objects. The handle should be comfortable and made of a material that will not get slippery when wet or slip while you are using it. The weight of the knife should not feel too heavy as well as not overtly light. Remember, if you're going to use it, you don't want it to feel like a brick after a few minutes of use. Think of it as an extension of your hand. With any knife the most important feature is the edge. 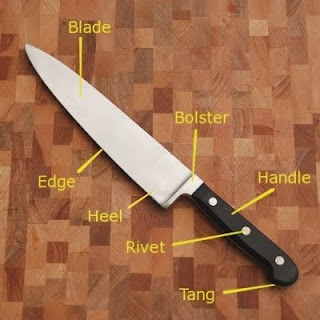 Without a sharp edge, you won't be able to slice a tomato let alone a piece of chicken, beef or fish. Keep it sharp with a honing steel. Stay away from grinders, as they can literally grind your knife down to dust. If you are uncomfortable about doing any sharpening, take it down to your local knife store that has the ability to sharpen knives. You will be happy and you're knives will last longer and will never fail to do their job as you get better at handling them. Also let's take a few minutes and talk about storage and safety. Store your knives, if at all possible, in a butcher block. It keeps the blade dry, free from nicks and chips, free of debris and above all, it provides safety. The last thing you want is to have a dozen knives in a drawer with razor sharp edges exposed to your fingers as you're searching thru the drawer. If you have to have them in a drawer, at least cover them with a blade guard. Those can be found at your local knife shop or online. A blade guard is cheap insurance against a trip to the E.R. for stitches to your fingers. And on a saftey note, NEVER, NEVER leave your knives in a water filled sink, let alone a suds filled sink. For one, you can't see what's below the bubbles and and if you stick your hands in forgetting about the knife, well lets just think about this?? Would you put your hands into a piranha filled tank? Ok,enough said! As to the cost of a good knife, prices can range from $75 - $500 dollars. But just because it's expensive doesn't make it slice any better. And if you never use it, then you have yourself an expensive potato peeler. A good knife can last for years. If you take care of them, they can last a lifetime. So go thru your kitchen and look for those old and never-used-but-once knifes and donate them to a charity of your choice. Because a bad knife is one that never gets used. So get yourself a good knife and work with it. After awhile you will wonder how you got around in the kitchen without it.